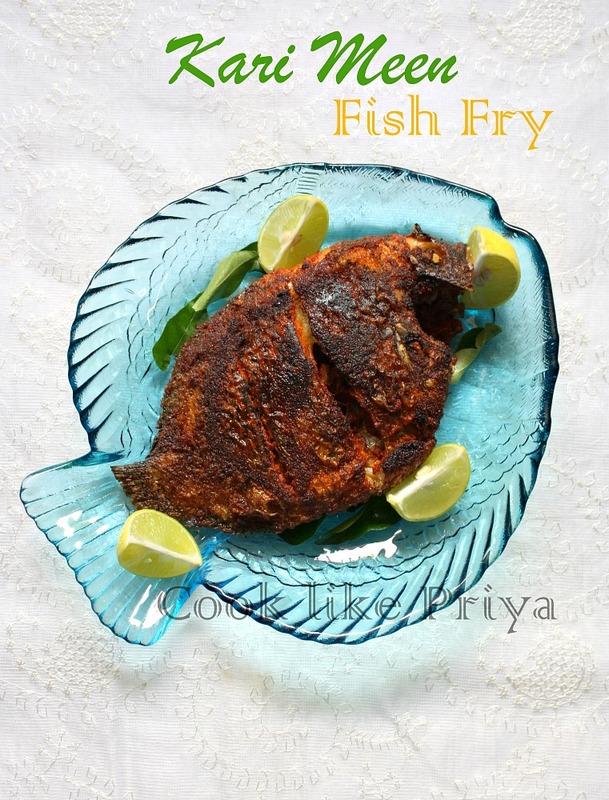 I love fish and I love to enjoy them along with sambar, rasam or curd and rice. Karimeen is one of my favorite fish, these are called as Green Chromide. They are found in backwaters and are very popular in Kerala & Srilanka. If you ask any Mallu they will tell you that this is one of the fish that they love and make some awesome recipes like Karimeen Pollichathu and Karimeen Molly. 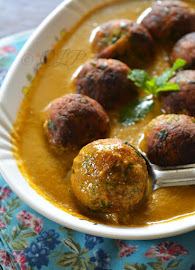 But today I used a Kerala favorite fish to make it the south Indian way. 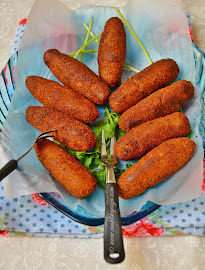 Really this is a must try recipe, very simple to do, but you are sure to have some awesome flavors. This fish does have bones that are big and long, but don't be fooled they taste great. Today my lunch plate was rice, parruppu rasam and karimeen fry ;-) with a content heart I am sharing this post. We all know that greens are great, Spinach are great and have important nutrients, such as folate, vitamin E and lutein, to keep your body strong. I make it quite often in different forms but my favorite of them all is this simple stir fry that is absolutely yum with shallots, spinach and garlic. 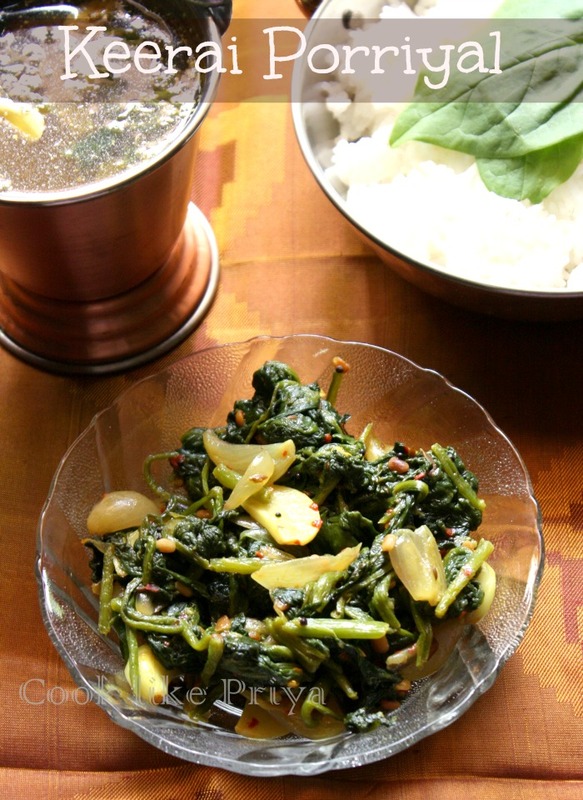 Perfect to go with any curry and rice. I love mangoes period! Be it raw or ripe, when it comes to pickles it has to be mango for me. I love to experiment using mangoes and hence I always had an eye to do mango rice. Like me Amma is also a mango lover :-). After seeing tons of recipes online, I was not at all satisfied and hence asked amma for her version. The result was a superb tangy flavored rice which was perfect in spiciness and the balance of mango. 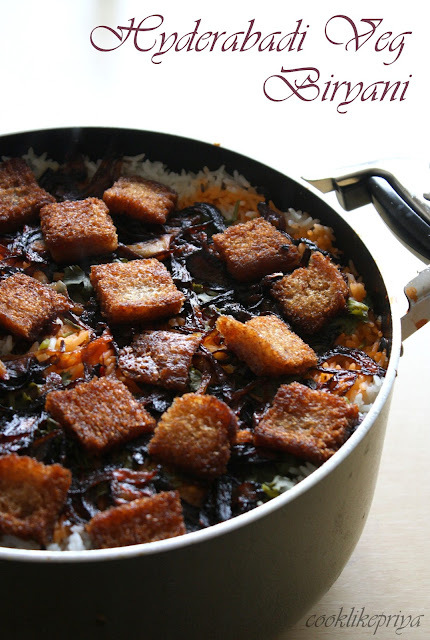 This rice is sure a delish, I found it more tasty as the flavors mingle after few hours. 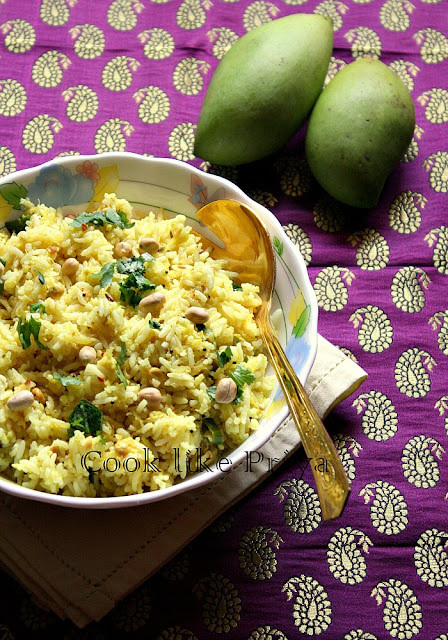 Mango Rice is perfect as a lunch box meal, variety rice or even as a main during those boring afternoons when you are done with the usual recipes. The punch of mango flavor does give this rice a unique taste and this is sure to make you drool and asking for more. Rava (Sooji/Semolina) Idly is a constant appearance in my house. Although R is not a big fan of them, I do have a liking towards these soft idlies and usually make them for dinner along with chutney. Earlier during my initial days of cooking I used to buy a rava idly mix and follow the packing instructions but I totally stopped doing this once I had laid hands on a fool proof recipe. 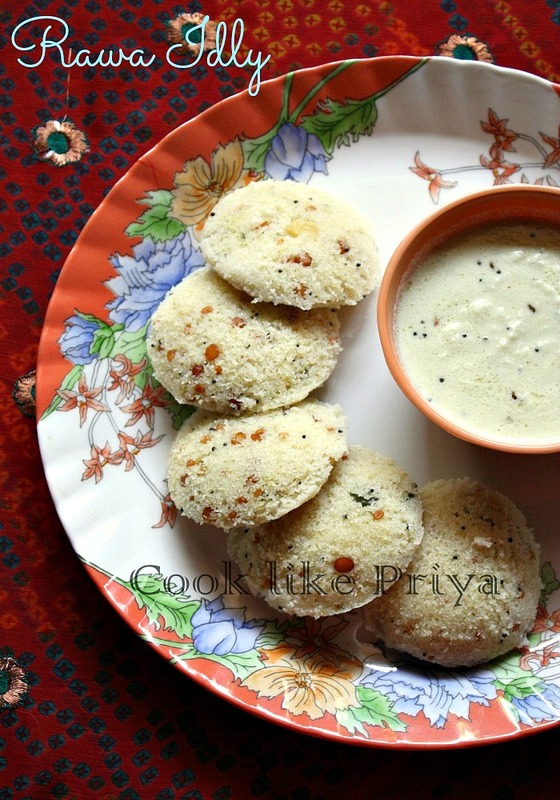 This rava/ sooji idly is so soft does not require rice flour/ dosa batter at all and when you are short of idly batter you know what to do now :-) Some love their rava idlies colorful with grated carrots but I somehow find the simple version better. Rava Idly has its origins from Karnataka, they appear more wide and with medium thickness. Usually served along with coconut chutney but my preference would be with groundnut chutney. The soft texture of the idlies which are made of tempered batter, at times with a yellow tint (which comes from ghee) is a popular and staple breakfast recipe in Karnataka. 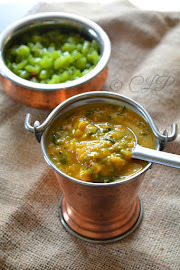 I love dal almost in any form but my most favorite version is this Moong Dal Chutney as we call it at home. 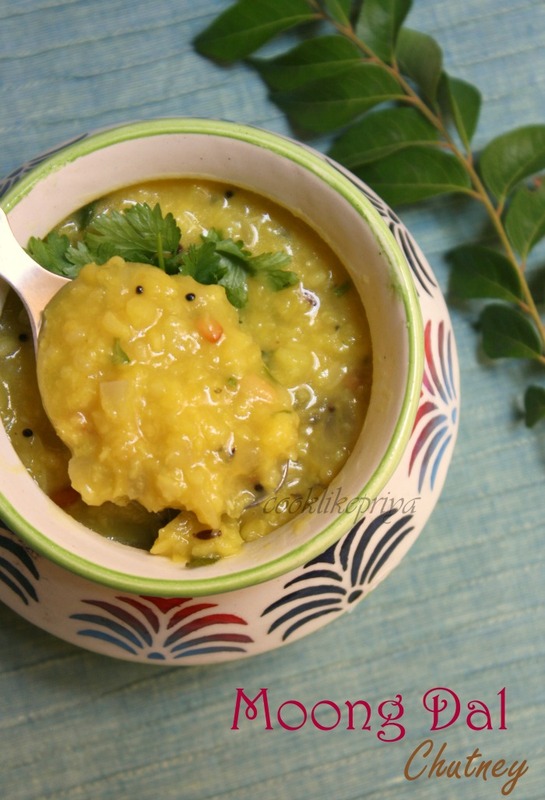 This Moong dal chutney is a great accompaniment with hot idlies, chappati or even rice. 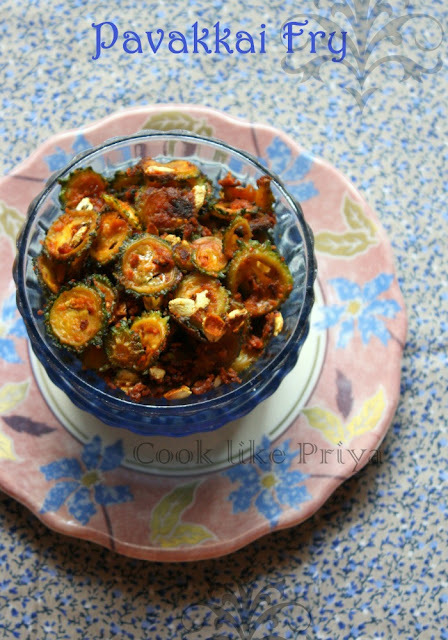 So very versatile and of course it has a special ingredient when Amma makes it that almost I do not get the same taste as she makes it. I am back with a lovely friend post today with Manjula Bharath from Desi Fiesta, she is a well known blogger who became a sensation with her Ghevar recipe challenge in SNC. Manju as I call her is an awesome cook and a fun person to be around. Although we have never met in person, virtually we have talked, laughed and even pulled each other's leg. There are always many that we can talk with but only few friends who will make you laugh, to me Manju is one such friend with whom there is never a dull moment. She is a beautiful mom of a pretty little girl Ishika and a lovely home-maker purely qualified with a Home Science degree (her personality is bigger than her degree). She is a Rajestani and mind you she will speak better tamil than me :P, we both hail from same city and I think this is what clicked between us instantly. Nannari is a common and most famous summer chiller drink from South India and since today is Tamil New Year's I thought of sharing a favorite recipe that is served chill with ice cubes, lime and the unique taste of the Nannari Syrup. Now tell me what other way to celebrate the new year and with a very hot weather? Nannari is my all time favorite and being in a place like TN we have only summer all through the year where temperature soar high during March - June and the peek being May. Nannari roots are termed to have medicinal properties and are typically sold in Ayurvedic stores in India. The roots of Nannari (also known as sarsaparilla) are a key ingredient in a popular summer drink in south India (Madurai). 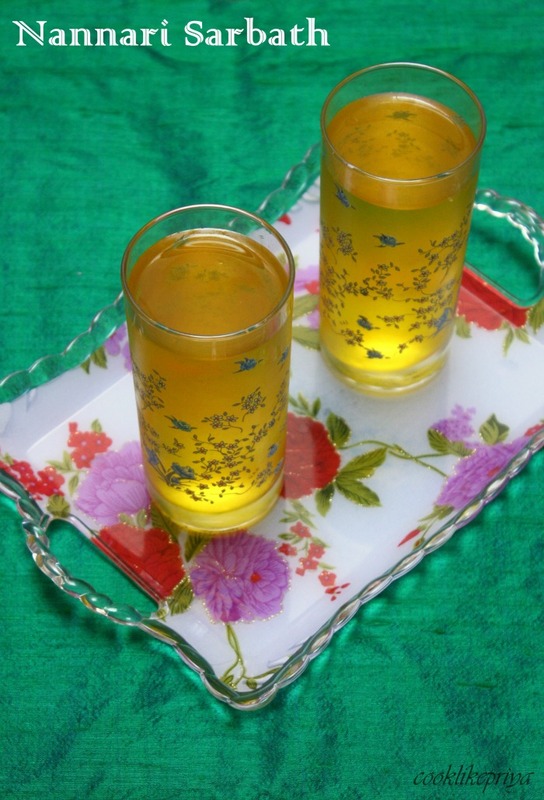 The drink concentrate, commonly referred to as Nannari Sherbet, is made by slightly crushing the roots of sarsaparilla and steeping them in hot water to infuse the flavors. 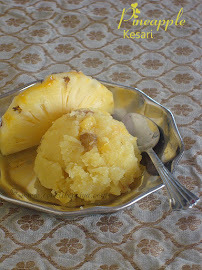 Jaggery syrup or a sugar syrup (or both) are added to this to make a concentrate. Most south Indian curries are known for their coconut in them. 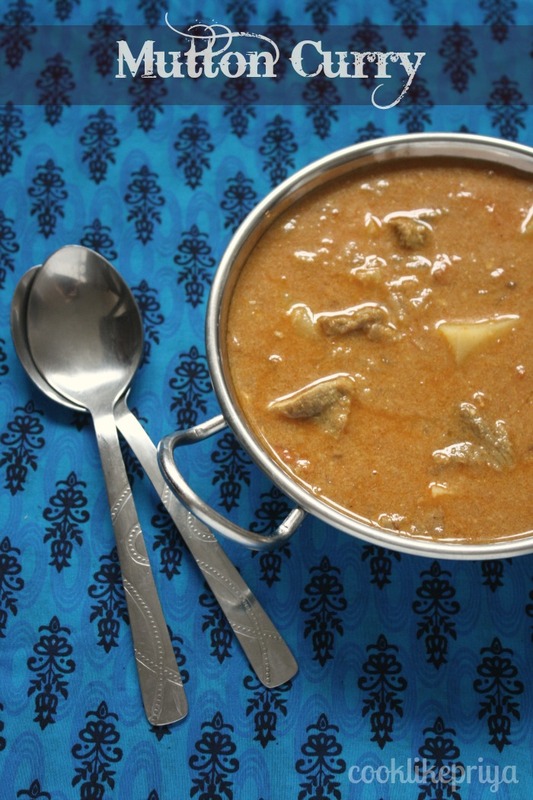 This one is no different its with coconut and a perfect accompaniment for rice/roti/idly/dosa, such a versatile curry. Make sure you made a big batch since it will vanish in no time :-). My absolute favorite and usually Amma makes it every Sunday for breakfast to pair it with soft idlies. Her version is adding some potato to it and that's what I have done today. Chickepeas/ Channa/ Kondakadalai Pulao is mild-low in spice and is a fragrant rice which will almost go with any veg stir fry, curry or simple like how I love it with little curd and pappad. Great as a lunch box recipe and a weekday meal. Since Chickpeas are loaded with protein and fiber you need not really add vegetables to get the fiber you need a day. 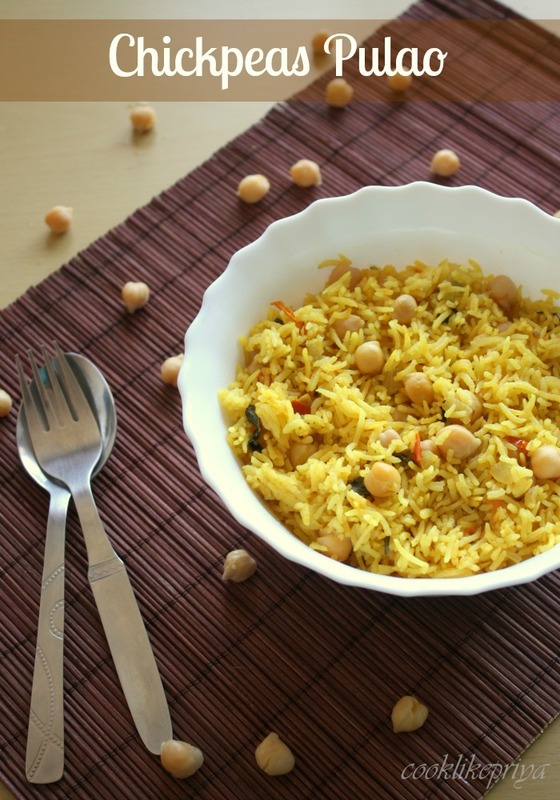 This pulao can also be made for potluck parties for the veggies. So try this pulao for a healthy and filling meal. I always love to try new recipes using chicken this time around I was curious to try a Spicy curry and was looking out for a great recipe. I bumped into my friend Preeti's Blog and was so excited to see a curry that was too inviting and at the same time called for no coconut. Her pictures made me drool and hence I was overconfident, I cooked them for some guests for the first time and a big batch. Nevertheless everyone loved it so much and at last we kept scraping the pot. 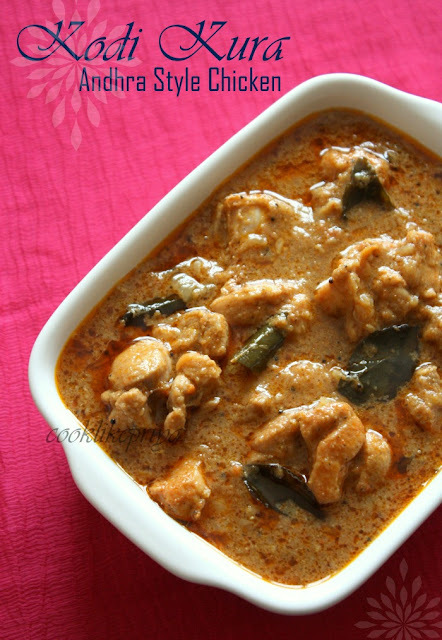 If you are chicken lover this is one hot curry to drool over. I was in a super hurry to click pics. I found the color of the curry a little different from Preeti's I guess it was the dry red chili that made the difference but I am sure the taste is equally great. Thank you Preeti for this awesome curry, which for sure is one of my favorite now. Looking at the above pic are your wondering, where are the vegetable??? its all at the bottom and center of the rice. Yes... wondering if it will get burnt? not at all. This is the best possible fragrant, vegetable biryani that I have ever had. 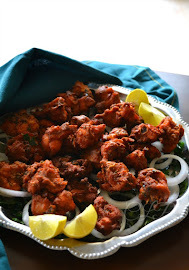 Such a fool proof recipe, and sure a great party pleaser when you have guests who are pure vegetarians. Well also for non veg lovers to pair with a non-vegeterain side. We had guests at home last week, and this time around it was challenging for me to cook something vegeterain but yet delicious and not the usual dal,sambar, rasam. 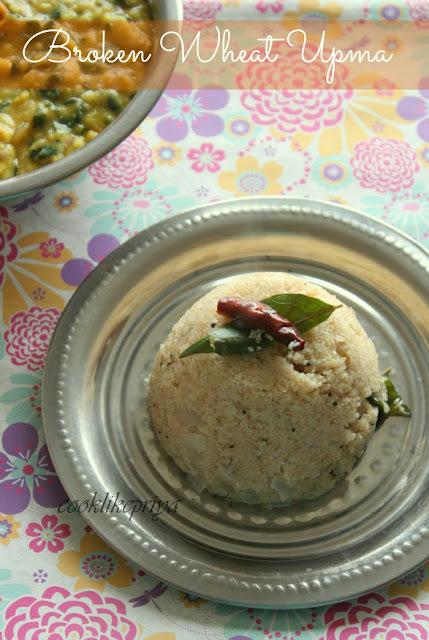 I took a little shift from the usual veg kurma, dal, rice combination to a biryani recipe famous from Andhra Pradesh. My all time favorite when it comes to Biryani is no doubt the Hyderabadi Mutton Biryani (Non-veg) and hence I did not have a second thought in doing this Vegetable Biryani as it was so similar to the biryani I love the most but the only twist of coarse is the vegetables instead of meat.